The company’s Secumar philosophy is to continuously develop tailor-made solutions in lifesaving equipment to meet existing and future customer requirements for equipment to protect them from drowning in any given situation. As a result, the technology of the lifejackets has become more and more refined: the construction of the automatic release mechanisms, already in their fifth generation, has become more robust and by means of a ‘traffic-light system’ increasingly fool-proof. The buoyancy chambers have become more durable due to new materials and processes and their airtight properties more reliable and the complete lifejackets have become more efficient because of shape, design and additional components such as emergency beacons and spray hoods. The company is certified in accordance with ISO 9001:2008, has a team of 100 specialists and an annual turnover which amounts to a double-digit million-Euro figure. Through its cooperation with international sea rescue services and many industrial, commercial and leisure users, it has not only an intensely thorough view of present practice, but also places great demands for the future on research, development and design of all product components. 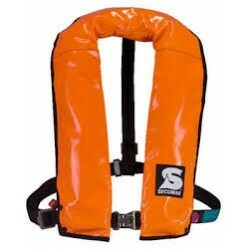 Fully automatic inflatable lifejacket for tough jobs. Robust protective cover. Very light, compact design.